Converts your positive battery post into three outlets with fuse protection. Perfect for 4WDs and caravans where many accessories or dual battery systems are in use. Quickly converts your battery post so you can easily connect three cables to your battery. Ideal for use when installing auxiliary accessories or connecting to a secondary battery. Includes three studs (1 x M8, 2 x M5) to ensure quick connection. Makes a professional and practical installation for distributing power. Provides the convenience of having three fused outlets making it safe and easy to install dual battery systems and other auxiliary cables. Save money by using one product that does the same as a battery terminal, terminated cable and a fuse box. Allows the load of a starter motor or winch to operate without blowing the fuse, but is still sensitive enough to blow in the case of a direct short. 150A continuous/800A peak fuse. Like most people in the motor industry, we have peaked into so many engine bays that they all start to look alike. However, the thing we often notice is the appalling quality of workmanship where extra power leads have been added to the battery terminal. Some set-ups look like they could have been designed by Frankenstein! Now there is no excuse for dodgy work. We are stocking a new ‘Fused Battery Distribution Terminal’. This unit effectively converts your positive battery post into three outlets – each with inbuilt fuse protection. It is ideal for most 4WDs where many accessories or dual battery systems are in use. And you save money by using one product that acts as a battery terminal, terminated cable and a fuse box. Plus, the snap-on cover helps prevent accidental short circuits. 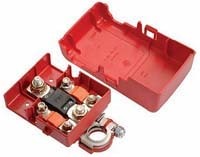 The kit includes three studs (1x M8, 2x M5), 2x 30A fuses and 1x 150A/800A CAL fuse. The CAL fuse allows the load of the starter motor, or winch, to operate without blowing the fuse, but is still sensitive enough to blow in the case of a direct short. Overall sizes are L 120mm, W 80mm, H 55mm.